Divergent signals have arisen in PP and PE markets of Asia and Europe for April as per the pricing service of ChemOrbis. European sellers are voicing hike intentions for PP while spot PE prices already gained ground in the latter part of March. On the other hand, major Middle Eastern suppliers have started to reveal their prices on a bearish note for April in China and Southeast Asia. When looking at Europe, price increases emerged in the PE market after buyers concluded their deals with decreases of up to €50/ton in the first half of the month. PE sellers who still have stocks started giving offers at higher levels compared to the beginning of March. Initial sell ideas for April called for hikes between €20/ton and €40/ton. 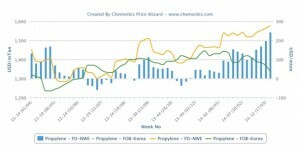 An agent of a West European producer said, “We also heard about €20-30/ton increase intentions for April but we are not sure whether these increases will pass as monthly ethylene contracts may not settle higher due to ample stocks.” He also said that even if there are long holidays next month, this will not have a large impact on PE demand as the agricultural film sector will face its high season soon. PP players also confirmed the hike intentions on the sellers’ side for April, although they are still judging their feasibility. As was the case in the PE market, PP sellers in Italy had attempted price hikes for March earlier in the month but they had to delay them to April due to unsupportive demand. A distributor of a West European producer said that their supplier is mulling over raising their prices by €20/ton next month. “We think that sellers may approach the market with slightly higher prices, but then they may concede to rollovers since buying interest is likely to be limited due to the holidays,” commented another distributor. 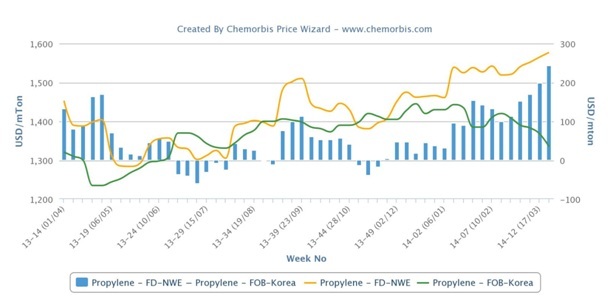 A Belgium-based distributor expects to see €20-25/ton increases while a German distributor thinks that there will be hikes of up to €50/ton for PP next month on the back of short propylene supplies. A Qatari producer also reported lowering LDPE by another $20/ton this week to China. “Overall demand remains muted and we are not able to conclude many deals,” a source commented. Players think that more producers will reveal their April prices at lower levels soon in the midst of high stocks and slower than expected demand. The recent easing of the Chinese yuan is also expected to put extra pressure on the market as import prices are already trading well above the domestic cargoes. According to ChemOrbis, following suit, Middle Eastern producers’ PP and PE offers have surfaced with modest declines to Southeast Asia. “We are not very optimistic about the demand outlook and we feel that prices may see some additional softening if buying interest does not pick up,” said a source from a Saudi producer.